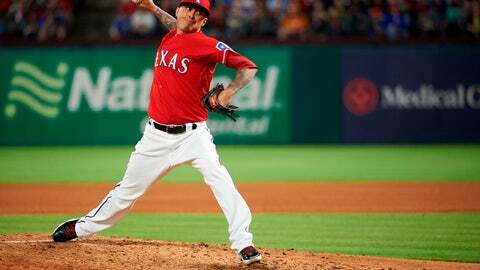 ARLINGTON, Texas (AP) — Right-hander Jesse Chavez finalized an $8 million, two-year contract with the Texas Rangers on Friday, returning to the team that traded him to the Chicago Cubs last July. The 35-year-old was 5-2 with a 2.55 ERA and five saves in 62 relief appearances with the Rangers and Cubs last season. He was second in the majors among relievers with 95 1/3 innings. Chavez had a 1.68 ERA after June 1, with 61 strikeouts and 11 walks in 64 1/3 innings. He made his postseason with the Cubs, pitching a scoreless inning in Colorado’s 2-1 win in the NL wild-card game. Chavez was selected by the Rangers in the 42nd round of the 2002 amateur draft. Chavez and Philadelphia’s Tommy Hunter are the only active pitchers with at least 390 innings as both a starter and reliever. Chavez gets $4 million in each of the next two seasons. Texas also failed to offer 2019 contracts to four players, including right-hander Matt Bush, making the quartet free agents. Bush didn’t appear in a game after June 14 and had surgery on Sept. 19 to repair a partially torn ulnar collateral ligament in his right elbow. The Rangers also let go of left-hander Zac Curtis, claimed on waivers from Philadelphia late in the season, as well as right-handers Ricardo Rodriguez and Adrian Sampson. Curtis pitched in 15 games for the two teams, compiling a 4.96 ERA. Rodriguez allowed three runs, all earned, over 6 2/3 innings in four relief appearances in a season shortened by right biceps tendinitis and a right shoulder impingement. Sampson was 0-3 with a 4.30 ERA in five September games, including four starts.